Nicely baked. I do love hemp seeds and recommend trying them in the next version. Hemp Seeds are readily available on Amazon, but if you don't want to buy food through the mail, your best bet is to go to a health food store or a Whole Foods (if in the U.S.) where you should be able to find them. Love how you changed the formula into a nice seeded sandwich loaf. 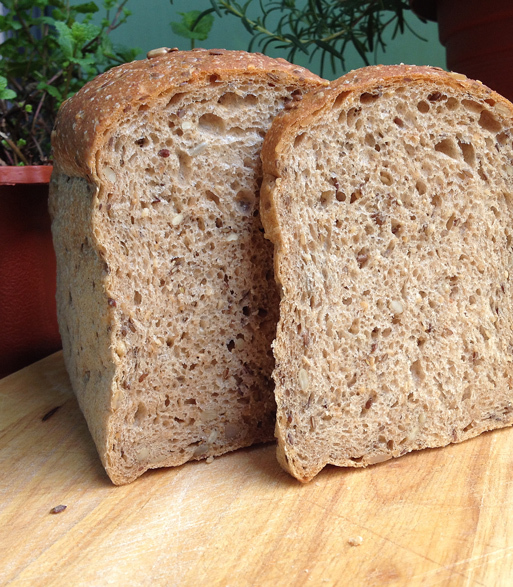 Looks very soft and flavorful….a bread I will have to remember when I want a seeded sandwich loaf . You summed it up perfectly, Janet; a soft, seeded, sandwich loaf. Actually, another reason for wanting to change the formula was because I found I was getting indigestion after only two slices of the original recipe. Not sure if it was the amount of seed in it or if the culprit was a particular seed (like flaxseed) but it gave me heartburn. Haven't had the problem with this loaf. Almost 2 years since you posted this loaf. I finally got to it as it was buried amongst my 'to bake' projects. Luckily it was not lost forever because the loaf turned out to be a splendid loaf and will be one that I will bake on a somewhat regular basis. As usual, I did tweak despite the fact that I know you produce great fail proof formulas in your kitchen. It is a habit of mine. Hard to break. I used txfarmer's 30% rye sandwich loaf as a base but I even tweaked her formula to include a roux, standard for me when I do a sandwich loaf with my whole grain loaves, and I lowered the rye to 20%. I also dropped the seeds down to 15% total due to the weight already inherent in my loaves given the bran and germ are included. I omitted the spice component knowing my family prefers 'plain' loaves or ones that contain cinnamon. (They are spice selective :) I used my firm leaven but also included 0.1% IY due to timing of my day and oven capacity. Loaf was bulk fermented overnight, proofed and baked on the following day. The end result was a soft sandwich type loaf with a splendid aroma due to how the seeds and the rye complement each other. I take it that my family approved of it since there is only 1/2 loaf remaining in the bread box and the loaf was baked yesterday….no complaints have been uttered so I consider that a 'successful' bake. I would include a photo but it would be redundant. My loaf came out of the oven looking just like yours but the crumb was a bit darker. Thanks for posting this loaf. My only regret is that it took me so long to get around to it. Good things are well worth the wait. What a gorgeous open crumb and loaded too! Though I'm not eating any grains at present. I love your beautiful sandwich loaf and I have post marked it. I like that you used both a preferment and the TZ. Sometimes nothing beats a good sandwich loaf. Thanks emkay. :) Yes, it is obviously not as strongly flavoured as Karin's original formula but it still has a lot of flavour from the rye preferment. The tangzhong adds tenderness and moisture and the seeds bring even more moisture. Beautiful bread Syd. You can't please everyone but this sure looks like a winner to me. Fortunately everything worked out smoothly the first time so it can go straight into tried and tested. Everyone liked this one too so I will definitely be making it again. Thanks DA. It rose higher than I expected. Probably something to do with the TZ and the extensive kneading. You could leave the bread spices out if you don't want them. I left them out the second time I made it and I prefer it without them. That looks superb, Syd! Tall and soft, and full of seeds. can't get much better than that. Thanks Khalid. I was very happy with the way this one turned out.